The year 286 in the Skyfire era. After barely surviving an assassination attempt and effectively loosing all of his holdings in Rhalgard to his rivals, the now landless Count Esran Tarlander gathered what was left of his treasure and made for the harbor town Kronald, seeking a ship that would take him to the eastern continent Calandhor. Like many other inhabitants of the Old Realms, he intended to start a new life in the colonies, far away from his homeland. After enduring two weeks on a crowded ship, he arrived in the capital of the colonies, Lumiar. The town was growing fast, serving as a naval base and prospering due to the silver mines run with native goblin slaves. Soon after leaving the boat, Esran realized he only changed a wooden prison for a larger one with stone walls, and so he spent all of his remaining coin on supplies, a few mercenaries and a goblin scout familiar with the land. Esran lead the small group into the wilderness to the northeast of Lumiar, where he hoped to find either a silver vein worth mining or another opportunity to rebuild his lost wealth. But after two of the mercenary guards deserted with most of the food supply in the middle of the night, the situation looked dire for the small expedition stranded in the middle of nowhere. After calling upon his gods, the goblin scout Sa Kuran discovered a large clearing densely covered with Ko'mai, a wild grass valued by the goblin clans for it's large edible seeds. Not only was the immediate starvation of the group prevented, but Esran also decided to settle down in the area, as it was obviously perfectly suited for growing Ko'mai, which he referred to as mountain grass. Eventually the governor of Lumiar and the Church of the Eye's missionary corps agreed to support Esran in his effort of establishing a farming community in the region, which he named Mountaingrass in honor of the plant that saved his life. His descendants continue to administrate the village to this day, and they even reclaimed the title of Count that Esran had lost back in Rhalgard. 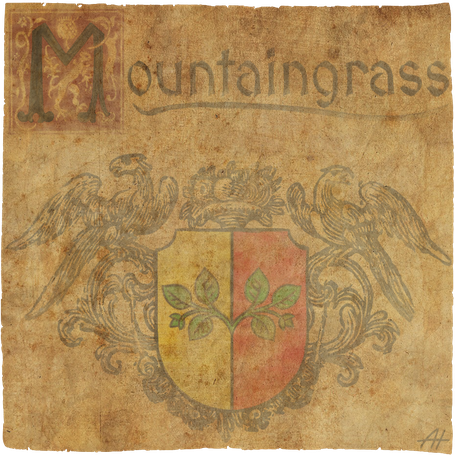 Mountaingrass slowly grew over the years, becoming an important trading partner for Lumiar in the southwest and the remote mining outpost Claymarsh to the northeast. Live was simple, but good, until one day a large group of bandits stormed the village, killed the Tarlander family in their house and burnt it to the ground. The people of Mountaingrass were shocked, seeing the corpses of Esran's descendants burning down with their estate. Luckily, a relative of the Tarlander family soon arrived in the village in order to take on the heritage of the founder family, and the Townsguard of Lumiar intensified its actions against bandits to increase security in the area. A few years of relative peace later, a landslide occurred in the east, blockading the only road connecting the village to the neighboring mining outpost Claymarsh, and thus ending the ore transports from there through Mountaingrass, which subsequently lost a good part of it's importance in the region. The village of Mountaingrass will be accessible in the full release of the game!